2016 Water & Transportation Conferences Early Bird Deadline Ends Tomorrow! Register now and save! The Early Bird registration rates for the 2016 Design-Build in Transportation Conference and 2016 Design-Build for Water/Wastewater expire this Friday, March 4. Both conferences are being held April 18-22, 2016, in North Carolina at the Charlotte Convention Center. Pricing will increase beginning Saturday so don’t delay! DBIA is now accepting nominations for the 2016 Brunelleschi Lifetime Achievement Award and the Distinguished Design-Build Leadership Awards. The Brunelleschi Lifetime Achievement Award is the highest honor DBIA bestows and is presented to an individual who has made significant contributions to the design and construction industry through outstanding leadership and the advancement of integrated design-build project delivery. Past winners include Richard M. Kunnath, P.E., DBIA; Craig Unger, DBIA; Michael C. Loulakis, Esq., DBIA; Dr. Robert Tener; and Walker Lee Evey. Please send nomination forms for the 2016 Brunelleschi Lifetime Achievement Award and/or the Distinguished Design-Build Leadership Awards to DBIA by June 30, 2016. Questions? contact awards@dbia.org. DBIA recently opened our application process for the 2016 Design-Build Project/Team Awards. This marked the kickoff of what will be a nearly year-long process that will culminate with our celebratory awards dinner and ceremony at the 2016 Annual Design-Build Conference & Expo in Las Vegas. We take the application and judging process seriously at DBIA and it is the rigor behind the awards process that gives them their cachet and gives the winners assurance that they are truly among the best of the best. Transportation Secretary Anthony Foxx pushed lawmakers Wednesday to approve a plan from President Obama to spend $98 billion on transportation projects this year. The proposal, part of a $4.1 trillion budget for fiscal 2017, calls for increasing federal transportation spending this year by about $40 billion over the amount that was included in a highway bill Congress passed last year. The U.S. House of Representatives approved a bill that increases oversight and management of Department of Veterans Affairs projects costing more than $100 million. The bill would put management of these projects into the hands of the Army Corps of Engineers or other federal agencies. It would also require that the V.A. provide Congress with progress reports. The legislation would also place financial restrictions on V.A. 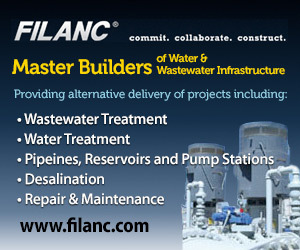 projects, with a 60-day notice requirement for planning and design funding. The House’s action came after concerns over mismanagement and cost overruns on a new V.A. hospital project in Aurora, Colo. That project is now expected to cost $1.7 billion — three times the original contract price — and is scheduled to open four years behind schedule in 2018. Investigators say the project’s problems stem from design changes, and the V.A. 's decision to use a complicated contract process. The bill also authorizes expansion of a Tampa, Fla., V.A. hospital, and provides $561.4 million for five other projects. The Department of Transportation (DOT) is planning to award $500 million worth of grants to states for infrastructure construction projects, the agency announced on Thursday. The grants, from the agency's 2016 Transportation Investment Generating Economic Recovery (TIGER) grant program, will be awarded on a competitive basis to projects that will be selected from applications from state and local governments, the DOT said. The contract to build the three men’s prisons will be awarded through a design-build process, in which a single entity will handle the design of the project and its construction. Dunn said they believed the approach would be more “cost-effective.” Bentley said the design-build proposal would only apply to the men’s prison project. Even with the enactment in December of the new five-year federal transportation law, the Highway Trust Fund will remain underfunded to meet our needs as many heavily traveled corridors continue to deteriorate at a rapid pace. Public authorities will continue to look for new ways to manage highway congestion, make the best use of limited capacity, and pay for rehabilitation and expansion of existing roadway infrastructure. A new report this week by the Center on Budget and Policy Priorities warns that state and local spending on infrastructure – including schools and wastewater treatment plants as well as highways and bridges – is at a 30-year low. Total capital spending as a share of state GDP fell in all but five states and the District of Columbia between 2002 and 2013, with the largest drops in Nevada, Florida and Michigan. A vocal public weighed in on the latest developments for the Little Falls Lake dam project – most of whom supported plans proposed by the Department of Natural Resources. After the meeting, Baumann explained that the prospect of a design-build process could be explored. Such a process would expedite the regular design-bid-build process by simply hiring a contractor for the project and establishing criteria to be accomplished by the firm, he said. While that process is seldom used, Baumann pointed to a project at Lock and Dam 3 on the Mississippi River, where he said the U.S. Army Corps of Engineers successfully utilized design-build. Dozens of U.S. cities are facing price tags in the millions or even billions to remediate their combined sewer systems, which currently channel stormwater and household waste into the same pipes, risking untreated wastewater flowing into waterways during heavy rain. Though the EPA mandates that cities eliminate these combined sewer overflows (CSOs) to comply with the Clean Water Act, cities are largely left to fund these expensive remediation projects on their own — through federal loans that must be repaid, or increased residential sewer rates. Government Buildings Go High-Tech: In addition, governments will shift to design-build and public-private partnerships to develop and operate their facilities without losing sight of goals for resilience, wellness, and productivity. End-user involvement in planning and robust change management will increase employees’ satisfaction with the facilities they occupy. When working on renovating an 83-year-old historic building like Union Terminal, it helps to know exactly what you're working with. Which is why the teams working to fix up the historic site have turned to lasers and cutting-edge technology to look at the building's bones. Denver’s Eagle P3 project is ambitious not only in its scope and structure, but in its approach to risk and insurance. Owner-controlled insurance programs (OCIPs) were more rare back in 2011, said Don Holmes, Denver head and managing director of the construction practice for RTD's broker Marsh. Public entities would typically defer such responsibilities to the project concessionaire. However, the approach is growing in popularity, thanks in part to the success of Eagle P3. How long can work under a contract be suspended before the contractor’s obligations will be deemed terminated? A lot longer than you might expect. In Avery Place, LLC v. Highways, Inc., a recent case from the Tennessee Court of Appeals, the Court was asked to consider whether the trial court had erred in granting a motion for summary judgment regarding a breach of contract action where the contractor refused to perform work at the price specified in the contract. The contract had been suspended for eight years. Many architects and engineers don’t like to talk about money. This isn’t to say that architects aren’t good business people, it’s just that money typically is not the reason an architect or engineer is drawn to their career; it’s about design. However, your clients – owners, developers, institutions, and corporations – are used to discussing money on a daily basis. And, in some ways, this can give them an edge over you when you are trying to get paid for your services. NASA developed a new stabilizing technology, known as the LOX Damper, in 2013 after working on a violently shaking rocket. Testing revealed that the Ares rocket, a crew launch vehicle, would shake so hard during ascent that it could harm astronauts on board. So one NASA team experimented with controlling the heaviest part of the rocket — its fuel. That got the team thinking: If this technique worked on a rocket, why not a building? New member listing as of Feb. 29, 2016.